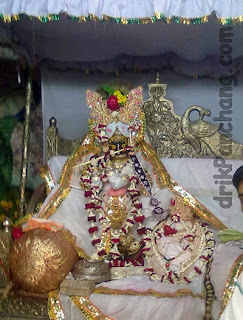 Today, on 13th March, Phulera Dooj was celebrated at Radha Vallabh temple in Vrindavan. Lord Krishna starts playing Holi with dry colors from the day of Phulera Dooj. Holi with dry colors i.e. with Abeer and Gulal continues till Ranga Bharani Ekadashi and after that Holi with wet colors starts. On the day of Phulera Dooj, Gulal is bundled in a cloth and tied to the waist of Lord Krishna. Devotees throng to the temple to sight Lord Krishna with bundle to Gulal tied to His waist. The deity of Lord Krishna is adorned with white dress. This special sighting of Lord Krishna is available in the evening during Sandhya Aarti. It should be noted that the Gulal is not tied in front of devotees but during the Shringar which is done behind closed doors. Radha Vallabh is one the famous and ancient temple of Vrindavan which celebrates Holi with all rituals.